The Cyrus 8 DAC Qx Mk2 ( or 82 QX DAC ). The Cyrus 82 DAC-QX is the highest performance integrated amplifier within the Cyrus range and uses a fantastic DAC card to convert digital sources to analogue without any mistakes or lost details. Comprising our very best components including one of the best DAC processes available, the Cyrus 8.2 DAC Qx is an audiophile integrated amplifier and DAC. It produces fantastic clarity and depth in recordings, and the on-board DAC means you can use it in conjunction with just about any source. Plug into our range topping CD Xt Signature or Stream X Signature, connect a computer or laptop, or link your TV or satellite box to transform the sound of films and TV shows. You can even play two sources simultaneously, letting you enjoy Cyrus’s trademark sound quality throughout your house. The Cyrus 8 DAC-Qx Mk2 is powered by a 330VA transformer, providing a huge 70 watts per channel. Its on-board upsampling 24-bit/192 kHz DAC provides audiophile performance, bringing the best out of all digital sources. The latest Cyrus integrated amplifiers are all based around a high quality, scalable design, you can order with a number of exciting options to create exactly the system for your needs. The 6a stereo amplifier delivers an impressive 40 Watts per channel and includes six analogue inputs that you can individually name from a list of options in the setup wizard. Also included is a great headphone facility and twin speaker output for bi-wiring. One of the outstanding features of this amplifier is that it is factory upgradeable allowing owners to retrospectively add the many other features found in the 6s’s siblings. 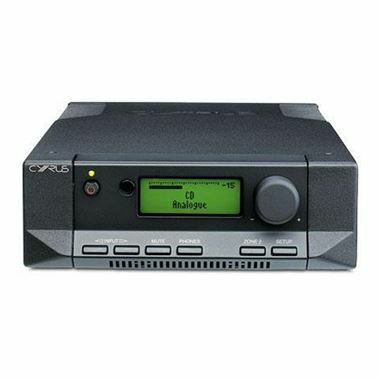 Cyrus 6a is the perfect partner for the CD i CD Player. This latest version of our award winning amplifier has been designed to include options such as higher power output, a choice of built-in digital decoders, more inputs, paint finish and matching components to boost performance. This overview outlines your options explaining how you can choose from our menu of options to create exactly the amplifier you need today, safe in the knowledge you can upgrade it tomorrow if you decide you would like to! Do you have digital source equipment to connect? A carefully designed top quality digital section can be built into the amplifier using a Burr Brown 24 bit/192k DAC and a special Cyrus power supply. This option adds 5 digital inputs that enable the amplifier to connect and dramatically improve the sound of your Computer, DVD player, TV or other digital source. Each upgraded to gorgeous Cyrus quality. Would you like to upgrade to a higher performance DAC? Upgrade the sonic performance further with a higher performance digital converter. This uses a superior converter IC plus upsampling techniques to boost sound quality of all connected digital sources. Cyrus’ biggest selling model is a separate power supply we make in a matching alloy chassis. Once you select the higher power amplifier it is possible to add the PSX-R2 power supply to substantially upgrade the amplifiers resolution and dynamics. Because Cyrus products enjoy the most advanced electronics they can be smaller than usual, allowing us to build them into a compact case made from pressure die-cast aluminium that helps refine sound quality. The special hand finished chassis can be ordered in either black or silver textured finishes selected to enhance the classic shape. We want you to create your ‘perfect’ amplifier at the point of purchase plus have the option to return your original amplifier to be upgraded with new opportunities later on. This upgradeable design concept has been created by Cyrus to provide the widest possible choice and the longest useful life for our products.